Why Ganesha ‘Lord of Obstacles’? A very happy ‘Sri Ganesha chaturthi’ to every one! It is a joyous occasion always. All our Centres in South Africa celebrate this day in a solemn manner. Importance is given to japa whereby the wisdom aspect of our personalities is stimulated. The day starts with a special puja to Sri Ganesha in our temple. Devotees, by turn perform japa of the above-quoted mantra from 6 am to 6 pm on a relay manner. In the evening it concludes with a satsang where devotees in chorus sing bhajans and kirtans interspersed with Talks or Readings. As children we were not only treated with different kinds of sweets during dining time, (note: earlier I wrote about that delicious dish Kozhuk kattai or modakam) but also were trained in lots of traditional practices that were initially appeared as queer but later loved. In igniting the imagination of the child, Ganesha worship would or even now stands supreme. Imagination about what? About creating a living contact between the visible human and the invisible super-human. It leads the growing child in the practice of devotion. This worship acts as a means in giving practical shape to develop a healthy and loving relationship with friends and neighbours. I am reminded of the allotted duties among the siblings and oh! what verve and vigour the children used to show in fulfilling their arduous(!) tasks like plucking flowers, cutting fruits, arranging durwa grass etc. A sense of camaraderie prevails that brings peace and happiness. May Sri Ganesha resolve all our conflicts! While harmony exists in its variation, discord and conflicts are also seen. Thus Nature brings all the beings into existence and provides opportunities ‘to evolve into higher and yet higher order of life’. All levels have their intrinsic two categories called Divine and Demoniac. This Cosmic Intelligence is symbolically called Ganesha. Those who are honest and strive to lead a peaceful life, thus possessing Divine qualities, He definitely comes to their aid. And he does not neglect those with asuric qualities. By creating obstructions, He brings disappointment in the minds of devotees as what was prayed goes not sanctioned! But in the course of life’s journey, a devotee finds out that seeming obstruction was in one way a blessing in disguise. In short by introducing lesser evils He wards off greater evils of life and Vighneshwara (Vighna – obstacles, Ishwara – Lord) rightly represents this particular aspect of Nature. How Ganesha came in the practical life through dreams and fulfilled the desires of the devotees is narrated here. It was sometime in 2005. This happened while I was in Ranchi. Once I received a post parcel that looked very tiny. Well, I just kept it on my study table; I never even ventured to open it. Everyday I was seeing it but somehow had no urge to open the parcel and look what the gift was. Suddenly one fine early morning a devotee rang me up to say that she was indeed frightened by a dream. I asked her what was the dream. She explained that she was entering into our Temple. She saw a small figure of Ganesha slowly emerging from nowhere and becoming crystal clear and was walking towards her. The image was in utter black colour. She asked me whether this dream was inauspicious. Consoling her with words of sympathy, I told her that seeing Ganesha is considered as most auspicious and who knows that black Ganesha wants to come to her home! Did she not tell me earlier that she wanted to worship Ganesha in some murti? So, I concluded by telling her that she might wait till Ganesha makes some arrangement. That day while I was just going out, the cleaning boy came and put that tiny parcel into my hands and said that I had not yet opened it as it was lying for many days on the table. I quickly thrusted it into my pocket and went out. While the conversation was going on I casually took the parcel and opened it and lo! it was black Ganesha murti! So tiny and cute, I said, “See! 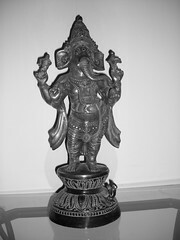 here He is!” I placed that Ganesha into her altar under the feet of the Mother Kali image. Well, son got his place again under mother! A devotee from South Africa, the other day narrated this following incident. It was in 1997. I was overwhelmed by money and power. I had a successful business and everything was hunky dory in my life. My day used to start quite early, leaving home everyday including Sundays at 7am and returning at 10pm. That meant neglecting my home, children and daily prayer. This continued for 2 years. Although I was a devotee of the Master from the age of 13 years, somehow at the age of 29, I faltered in my spiritual life. My conscience used to prick me every now and then….. but still I neglected my sadhana. As the second year was coming to a close, my body and mind was beginning to tire and so were my kids on whom I could sense the effect of neglect. It was late one night while I was asleep, that I had a wonderful dream… or was it real, I will never know that… Lord Ganesha came to me while I lay on the bed and spoke softly to me. He kept telling me ‘arise and offer some fruit and milk’. I could still see Him in His flowing yellow dhoti and with a flower garland around His neck. When I was reluctant to get up, he firmly, at the same time, very lovingly coaxed me to wake up. I lay in my bed wondering at the strange, yet divine dream that I just experienced. I gazed around to see whether the Gracious Lord was still in the room, was it my imagination, was it a dream, was it real? who knows! After a quick bath and breakfast, just out of curiosity I went to the calendar to check what day it was… I WAS STUNNED TO SEE IT WAS THE AUSPICIOUS DAY OF GANESH CHATURTHI. I immediately went into my shrine and offered milk to the Lord and realised that the Lord is continuously knocking on my door, and He is waiting for me to open. It was on that auspicious day that by the will of the Lord, I quit my job and became a mum to my kids and held on tightly to the Lord’s Feet… Never to let go AGAIN! Previous Post: Krishna Ashtami greetings! Happy ‘Sri Ganesha chaturthi’ to all the readers. So much has been imparted in just this one article! Swamiji, you always have the alternate reasoning and explanation. Very nicely put! And of course, two very inspiring stories, illustrating how the Cosmic Intelligence (Ganesha) is keeping “us” as parts in this cosmic automobile functioning. Swamiji, by your grace, I too have seen the power of Sri Ganesha in my own life. Yes, the power of that Ganesha mantra is inherent in those syllables. But do you know what awakens that Power? It is your faith and devotion to the deity. Strong faith and devotion can do wonders! May God Ganesha be generous in getting you freed from all stumbling blocks! This is indeed a festive weekend, with the double celebration of Eid and Ganesh Caturthi! Even the stars and charts are pronouncing oneness. It is only we fools, that keep on fighting! Ganesha always captures a big share of Indian hearts. Fondly remembering the gusto with which celebrations happen in Maharasthra. My pranam on this holy day. Rightly said! Yes as Master explained Shiva and Rama became friends but the bhutaas and vaanaraas are still fighting! We are in the middle of a race between human knowledge as to means and human folly as to ends. Unless men increase in wisdom as much as in knowledge, increase of knowledge will be increase of sorrow. May God Ganesha be generous in getting you freed from all stumbling blocks in realising the Unity! On the very auspcious day of Ganesh chaturthi, your blog reached me bringing His Blessings. Nice reminder of Chinnu Maharaj‘s wonderful explanation of Saguna brahman as an automobile machine!! Reminded of Lord’s glory through the 2 interesting incidents showing awakening of Him in their minds! Last year you gave Ganesha pancharatnam, now Him and 2 devotees! Happy to note that this Blog is of some use! We always referred Chinnu Maharaj as Chidbhavananda Swamiji. During my school and college days in the then Madras (now Chennai), I used to visit the T’Nagar Ashram where one Mandiram Sir was staying. He only introduced that great Swami to us, some youngsters who took deep interest in reading the Ramakrishna-Vivekananda books. Chidbhavanandaji’s books are even today fascinating. I hope you had gone through the “Facets of Brahman or The Hindu Gods”. The last chapter is unputdownable! I am so happy that you remember my posts too well !! And for Kozhukkattai, yes in the evening supper time a Hindi-speaking devotee brought a few pieces that were sweet and enjoyable. The unbounded devotion in making it for God Ganesha added much taste. May God Ganesha be generous in getting you freed from all stumbling blocks to spiritual journey! It was in the year 1997 that I was blessed by my GURU MAHARAJJI to visit MANSOROVAR. There, I collected many stones, as I heard that all stones are symbols of SADHUS. At home, in Kolkata, while washing the stones, my husband to his utter surprise saw one stone looked like GANESH. I showed thIs small idol of stone to Swami LOKESWARANANDAJI MAHARAJ in Golpark. He was very happy; he did pranam; kept over his head and told me to keep it in the shrine, and do puja. I also do believe that He came to me unasked through HIS infinite grace. I just wanted to share my inspiring incident with all the fellow readers of this excellent Blog! A warm welcome to you for sharing your interesting experience with all of us! Though I had no opportunity yet to visit Manasarovar in the Himalayas, I can very well understand the deep reverence for the stones and that too with the form of familiar Gods. It is indeed a Shiva-sthal, Shiva-spot, utterly holy and auspicious. All objects of this world wherever they are, are nothing but God’s forms whether familiar or unfamiliar. God ‘s forms are infinite. But the joy of seeing known form of God in any material object knows no bounds! You are indeed blessed! May God Ganesha be generous in giving you more such experiences! I am very much happy to see the nice photo of Lord Ganesh, as, in Kolkata, Ganesh puja is not so popular! So I really enjoyed and offer my sincere pronam to Lord Ganesh. Yes, I also did notice that in Kolkata, Ganesh puja is not as publicly prominent as done in western parts of India. Yet, Ganesha comes first in all undertakings. He has sizable number of devotees too there. Hindus, Buddhists and Jains in Kolkata have in their homes Ganesha murti in various sizes. May God Ganesha be generous in getting you freed from all stumbling blocks in spiritual life! My humble salutations and adorations at Thy Lotus feet! Greetings on Sri Ganesh Chaturthi! Maharaj, You were in my thoughts just now so it felt good when I saw this mail. The narration of the black Ganesh was inspirational and brought tears to my eyes and a smile on my face. Thanks for sharing this! I like the manner in which you always inspire us to intensify our faith in God through your beautiful narrations and spiritual experiences. Even a child can relate to Maharaj’s simple yet powerful and thought provoking words. Welcome to this Blog! I am happy that you liked my Posts. Do you know that if noble thoughts and good ideas appeal to you, it is because of your inherent nature of being noble and good. No credit to narrator! As I told somewhere else too, this blog is nothing but a simple tale of private diary for public viewing! Namaskarams Swamiji on this auspicious day! Very nice post especially with the Ranchi incident. Welcome to this blog! Happy that you enjoyed reading. I am a monk of the Ramakrishna Order. Today I am attached to the Holy Founders of the Ramakrishna Mission but throughout my earlier years, I was attached to Lord Ganesh. Now Lord Ganesh is not leaving me though I never worship him, remember him nor fold hands. I have not kept a single photo or statue of Ganesh with me. Even then, He is showering His blessings on me by way of appearing in VIVID dream, etc. A monk should never boast about. So I am stopping here. But the point is the grace of Sri Sri Ganesh is on me UNASKED for. It is to say the least, gratifying to note your observation. Yes, I am happy that you are able to feel the presence of Sri Ganesh’s grace with you. It does little matter whether you worship Him, or keep His image with you. All these external aids actually go to assist a sadhaka to ultimately internalise the worship. Since you have reached that state you no longer require those aids. So, brother, your vivid dreams of Ganesha indicate that Godly thought is pervading your subconscious mind. But, know whatever be the dream – whether pleasant or horrible,- its interfering with your having a DEEP SLEEP. That means the subconscious is STILL working and the required rest is not available to the brain. Thats how being one of the reasons, the sleep specialists explain that we sometimes feel exhausted on getting up from sleep. Some do not even remember their dreams! There is a simple way of Auto-suggestion suitable to devotional types that you can try. Just before lying on the bed, apply a little vibhuti (bhasam) on your forehead telling Om namah Shivaaya three times. Then after lying down, say to yourself in a commanding tone as if you are ordering a naughty child to discipline: Look ! Tonight you are going to have undisturbed sleep. You are not going to dream at all. Then pray to Nidra Devi, the Goddess of Sleep saying, please Ma Nidra devi, bestow me dreamless sleep tonight. People who have tried this Auto-suggestion told me that lo! their sleep had become more natural and they could get up next day with vim and vigour! My humble pranam at your holy feet. Accepted with gratitude your suggestion for getting deep sleep. As a matter of fact, “Vivid Dreams” are a rarity only & I do enjoy deep sleep. But, as you have rightly pointed out, there have also been occasions wherein the sleep was disturbed by dreams which can’t be remembered after waking up. Now that I have received an aid from you, I WILL CERTAINLY TRY IT when such things happen again. Just read the blog. It was inspirational and the explanation of why Ganesha is the Lord of Obstacles was amazing. The black Ganesha murti incident was a very nice and auspicious story to read about. In fact, mum has started going regularly to the Ramakrishna Math in Sydney for meditation class on Mondays and she is really enjoying it. I will make sure i go too soon! Thanks for your visit to this blog and appreciative words! Some time back i did hear from your mother that she has started to attend Meditation classes at our Sydney Centre. it is indeed a welcome step. This would definitely help her in assessing her mind and assist in further spiritual progress. You also must attend such classes. The Head of Sydney centre is Revered Sridharanandaji Maharaj. He is so well versed in Gita and other Vedanta scriptures, his classes attract sincere seekers and have great value for humanity. I hope you will utilise the wonderful opportunities that are present in your country. Having read this brilliant post, I felt that not only it enhances our spiritual knowledge but makes us want to delve deeper into the realm of Divinity. The noble and interesting experiences that we read on this blog induces pure and powerful thoughts and ideas to us. Please pardon for my silly query on Ganesha. In some paintings on Ganesha I find a small snake tied around His belly. 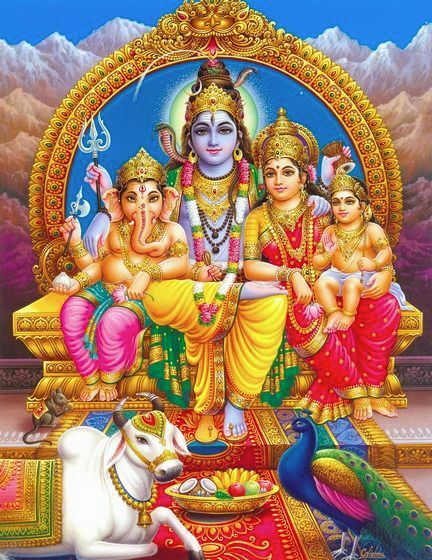 How is a snake connected to Ganesha symbolism? Is not mouse and snake eternal enemies? Heartfelt thanks Swamijee for your excellent blog. 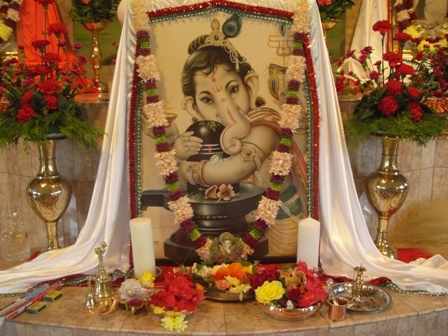 Thanks for your appreciative words about the Post on Ganesha! To answer your query on snake on Ganesha, you must know a little story behind the symbolic snake. It runs like this: Once mother Parvati cooked for him twenty-one types of delicious food including his most favourite modaka. His big belly (lambodara) was full. Mounting his little mouse, when he was travelling, his mouse suddenly stumbled upon seeing a huge snake. To adjust His belly, Ganesha put the snake on as a belt around his stomach. The story of course goes on further but not relevant to the present discussion now. The snake symbolism has a deep Yogic significance. Lord Ganesha is considered the presiding deity of the Mooladhara Chakra. This is the first Chakra wherein the Kundalini shakti is lying dormant like a coiled sleeping serpent. The snake around Lord Ganesha’s belly reminds us that we have to awaken this energy to reach the state of expanded consciousness. The snake around the belly also shows that everything in nature (the pot-belly) is supported by one energy. The whole cosmos is known to be the belly of Ganesha. Parvati is the primordial energy. The seven realms above, seven realms below and seven oceans (21) are inside the cosmic belly of Ganesha, held together by the cosmic energy (kundalini) symbolized as a huge snake which Ganesha ties around Him. I bow to the Lord, who is the remover of obstacles, the giver of boons, the beloved of the virtuous, who has embedded in his belly the whole cosmos, who wears the serpent, who is entreated by the devotees’ sacrifices,To that son of Gauri and who is the lord of All, I offer my prostrations! Thank you for answering my question. It is much appreciated. We are often asked questions of a similar nature at our Children’s classes. It is always wise to be fully equipped with spiritual knowledge in order to teach the basics of Hinduism to our children. Once again, I am happy to say that Swamijee’s blog has been of immense help. Due to I-net connectivity problem of Broadband (BSNL), your kind and very colorful Janmasthami greetings could be accessed by us just today. We are overwhelmed to receive your kind message and greetings. In fact, we regularly receive your messages through the blog which not only provide us immense pleasure but also enrich our spiritual knowledge, understanding and realization. Sorry to note that you had net connectivity problem. But I am pleased that you could finally respond. How is Revered Swami Tapanandaji Maharaj? He has been of late not keeping good health, I heard. Please convey my loving pranam to him. Greetings to you on this auspicious occasion (although somewhat belated!). Thinking of Bhagawan Ganesh always tends to lead me to reflect on the most venerable Srimat Swami Saradanandaji, the burden bearer of Sri Ramakrishnadev and Sri Ma. Just like in Bhagawan’s leela, the venerable Swami would stand guard at Mother’s door in Udbodhan, which even today is sanctified by the imprint of their presence. As always, one is blessed to engage in spiritual communion here in this world wide web, as also gather knowledge to ruminate on, and thus experience peace! Thank you for this kindness Revered Maharaj! Welcome and better late than never! Indeed Saradanandaji’s standing guard at Mother’s house is legendary. I remember another direct disciple Swami Niranjanandaji‘s standing guard at Master’s door in Cossipore! During this time Master told Niranjan: “Look, I am now in such a state that whoever sees me in this condition will attain liberation in this life by the grace of the Divine Mother. But know for certain that it will shorten my life.” Upon hearing this from the Master, Niranjan became more vigilant about his guard duty. He sat at the gate day and night with a turban on his head and a stick in his hand to keep outsiders from visiting the Master! And think of that Brahmachari who stood guard at Swamiji’s room on his last day of his earthly stay in Belur Math! This guard duty is not definitely a pleasant one! Think also of those two guards – Jay and Vijay – of Bhagawan Vishnu! They even disallowed the famous four rishikumars who cursed them to be born on this dreaded earth! 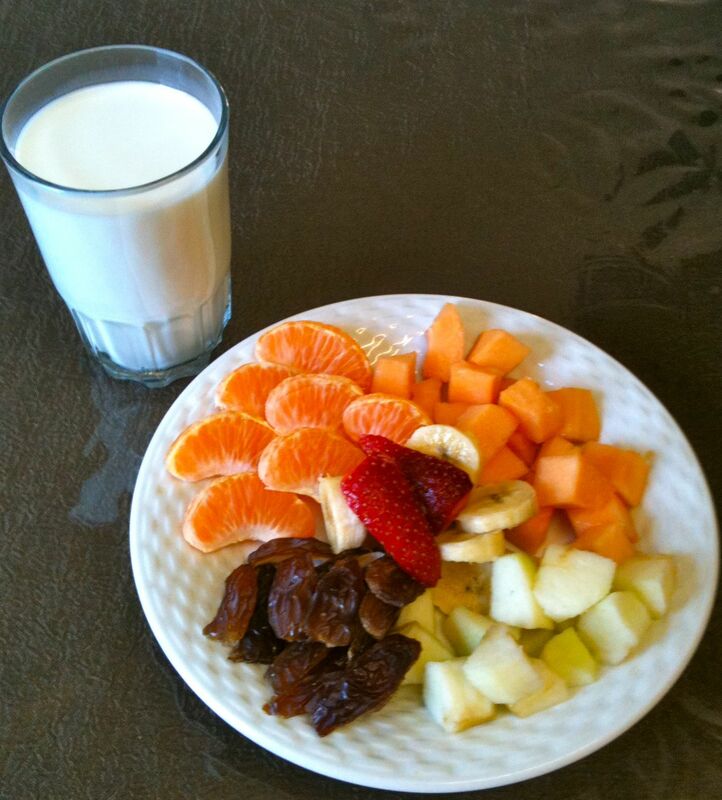 Yes this blog is my e-Sadhana! Yes, it is indeed fitting to remember venerable Srimat Swami Niranajananandaji and the revered Brahmachari Maharaj. But for me it is easier to connect Srimat Swami Saradanandaji, as perhaps Bhagawan Ganesh is Mother’s doorkeeper first! Also, Revered Maharaj, I have read the wonderful comments and your responses above and I would like to share here that whatever I read at your blog, I share with my parents and friend(s) and really enjoy the discussions. We are all enjoying the fruits of your e-sadhana, reminding one of the saying that a Sannyasin is like a tree bearing fruits for all but itself. Well, it is not possible to controvert an argument from not only a ‘philosopher’ but who is also a ‘feel’osopher! I fully agree with you about Saradanandaji. Some historical truth is the nucleus of every Purana. The object of the Puranas is to teach mankind the sublime truth in various forms; and even if they do not contain any historical truth, they form a great authority for us in respect of the highest truth which they inculcate…for the purpose of estimating the philosophical truth contained in any Purana, we need not consider the question whether the personages treated of therein were really material men or were fictitious characters. The object of the Puranas was the education of mankind, and the sages who constructed them contrived to find some historical personages and to superimpose upon them all the best or worst qualities just as they wanted to, and laid down the rules of morals for the conduct of mankind…but there stands the grand philosophy contained in the Puranas. And many thanks for sharing the ideas of the blog with your friends and relatives. The views of readers like you give the blog-ger a definite source of encouragement. I am humbled at the one SA ‘devotee-reader-duo’ providing me the wherewithal to maintain the i-connectivity to run a blog! Maharaj, who would dare to argue with one such as you? I humbly apologise if I have seemed childishly stubborn but that is how one feels in the presence of great souled ones – childlike. Therefore, if one is a little too free and perhaps disrespectful, it is unintentional and so please excuse me. Very grateful to you for sharing Swamiji’s advice on the Puranas. I have such a fascination for stories and their telling since childhood. And it is something I have not yet outgrown, intellectually or spiritually. Infact, it was the stories that drew me to God. It is our privilege to be able to read this blog and discuss it! So thanks are due from all of us. Thanks for this new insight on Vighneshwara! I always thought it meant ‘Beyond Obstacles’. Didn’t realise Ishwara meant Lord. Lovely incidents have been narrated here. A really surprising co-incidence took place this year. During Varakshmi Puja in our house, the diety was by chance dressed up in yellow and surprisingly the Ganapathi idol that was bought about a month later was also dressed in yellow!! Wonder if it means something! !